The Universal is quite a lot larger than the Busker or the Senior 20, weighing in at around 65 lbs. It can be made with 20 or 26 notes, but uses a windchest into which four rows of 20/26 pipes are plugged. The extra air flow needed for four pipes - possibly all sounding together - instead of just one means that pneumatic valves have to be used. The small air flow passing through a hole in the paper roll 'triggers' a valve, which opens a much larger airway to the set of four pipes. Again, the extra air flow requires larger bellows - three sections being used in place of the pairs of bellows used in the smaller organs. The four rows - or ranks - of pipes can be turned 'on' and 'off', just like in a church organ, by the use of 'stops'. These stops are actually sliders that have holes to allow - or inhibit - airflow to each rank of pipes. As each row of pipes is constructed to produce a different 'sound', operating the stops during the playing of a tune to switch the individual ranks 'in' or 'out', can change the overall presentation of the music. The instructions and drawings include the designs of several different type of pipes, each with its own characteristic 'sound', from which the constructor can choose the combination he prefers. A fast rewind system is included for the paper rolls, and a multifunction 'conductor' can be positioned in front of the pipes. The plans and instructions also include details for the construction of a 'glockenspiel' (mechanical metal-bar xylophone), which is fitted to the front of the organ during performances, but which can easily be removed for transportation or storage. 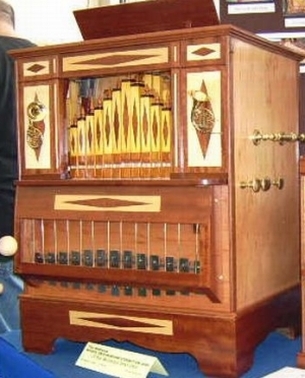 This organ is definitely intended to be used on a cart, or on a table top. The construction of the Universal does require some greater experience of woodworking and machining than that needed for the Busker and Senior 20, as some of the work requires some degree of accuracy. However, you still need to be prepared to read and follow the instructions, and to watch the DVD to get the final details. You also need to be able to work from basic drawings - if you need full engineers drawings with every small detail shown, then this package is not for you! There are 20 A4 pages of instructions, and 32 A4 pages of drawings. Along with the DVD or Video, there is a drilling guide for the tracker bar. Again, one aspect of the construction that might cause a problem to someone without metal workshop facilities is the fabrication of the three-section crank used to operate the bellows. If needed, help with this can often be supplied by the local model engineers club, or the metalwork department of a local school or college. Alternatively, there are companies who offer various parts used in the construction of the Universal, as ready-made items - such as Roll Cutter - and these are listed on the Links page. No details are given for front panel or case finishing, as this is left to the individual builder. You will see in the DVD that the organs can be made successfully using cheap, easy to work materials, but there is much scope for the advanced hobbyist to incorporate more refined engineering or exotic woods. Pictures of some Universal organs, and others designed by John, can be viewed in the John Smith Photo Gallery on Melvyn Wright's site. Melvyn is a music arranger who gets the best out of a restricted range of notes, and who supplies punched paper rolls suitable for John's organs - see the Links page. He also has a page devoted to Articles about the John Smith Organs, which contains lots of useful tips and hints from other people who have made John's organs.